Where Do The Patriots Go From Here? Moments after losing Super Bowl LII to Philadelphia, the Patriots opened as the favorites to win Super Bowl LIII come February 2019. No one should say they’re surprised, as the Patriots tend to be in the mix every season. But if New England wishes to get back to the big game and actually win next year, clearly something needs to change. Not whole sale, massive changes, but something. The Patriots defense proved to be every bit as terrible as Football Outsiders said it was over the course of the entire season. In a game where Tom Brady threw for 505 yards and the offense put up 33 points, the defense literally needed one single stop for New England to be crowned Super Bowl champions. It was the lowest possible bar they could have had set for them. Instead, they were that atrocious, not even hitting the bar, and it cost the franchise a 6th Super Bowl victory. My guess is Belichick is going to be aggressive this offseason in getting his team into a better position to win in 2018. You may find this some what of a lackluster prediction since of course he is going to try to better the team, but I am talking about being really aggressive here. Belichick has really only broken from his long-term, big picture strategy on a couple of occasions. In the offseason of 2007, Bill Belichick went nuclear on constructing an unstoppable roster. After watching Reche Caldwell draw no one in coverage and drop the ball in the same AFC Title game where the Patriots blew the biggest halftime lead in conference title game history, Belichick maneuvered as if the 2007 goal was to conquer the galaxy better than The First Order could ever dare dream. First Belichick conned a divisional rival into trading him Wes Welker. Then he signed Donte Stallworth in free agency. And of course, he brought in the disgruntled Randy Moss from Oakland in one of the most lopsided trades in NFL history. Belichick also brought in defensive Swiss-Army Knife Adailus Thomas, who has the highest graded Super Bowl performance by an edge defender in the history of PFF. We all know how the 2007 season played out and while it ultimately was a failure the aggressiveness did work. Belichick’s favorite draft day hobby is to trade down, trade down again, and trade down once more. When he’s done with all that, he trades down some more. Belichick clearly believes in the concept that trading up is a no-no because no one can beat the draft. But on draft day 2012, Belichick traded up not once, but twice, in the first round. This happened in response to watching, for the second time in five years, his team lose in the Super Bowl to the New York Giants because on the final drive of the game the defense couldn’t prevent a touchdown. Specifically to the 2011 team, they were the second worst defense by DVOA to ever reach the Super Bowl (behind the 2017 Patriots). Those first round picks yielded New England Chandler Jones and Dont’a Hightower. Chandler Jones has performed at an All-Pro level for multiple seasons since entering the league, and led the NFL in sacks in 2017. It took a few years for the picks to pay off but Jones was on the 2014 team that won the Super Bowl. He was eventually traded for pennies on the dollar after a bizarre incident involving the police. Dont’a Hightower remains and in each of the Patriots past two Super Bowl victories has made a massive defensive play to swing the game. He wears the green dot on defense, but ended the 2017 season on IR. The 2013 Denver Broncos rewrote the NFL offensive record book. The 2013 Patriots limped into High Mile Stadium severely undermanned for the AFC Championship and lost by 10. The injuries helped hold the offense to only 16 points that afternoon, but even with a full compliment of weapons returning from injury in 2014, Belichick knew he had to stop the Denver offense for the Patriots to have a chance. That 2013 Broncos team got blown out in the Super Bowl by Seattle and John Elway went nuclear himself when the new league year opened. Within the first 24 hours of free agency, John Elway signed T.J. Ward, DeMarcus Ware, and Aqib Talib to multi-year contracts. The arms race was on. Once the Tampa Bay Buccaneers released Darrelle Revis, Belichick got the first meeting with Revis and didn’t let him leave the building without signing a contract. Belichick basically gave Revis $12 million cash to spend a single season with the team. There really is no other remotely similar free agent signing in Belichick’s history to this move. It also saw Revis win a ring in his lone season in Foxborough. 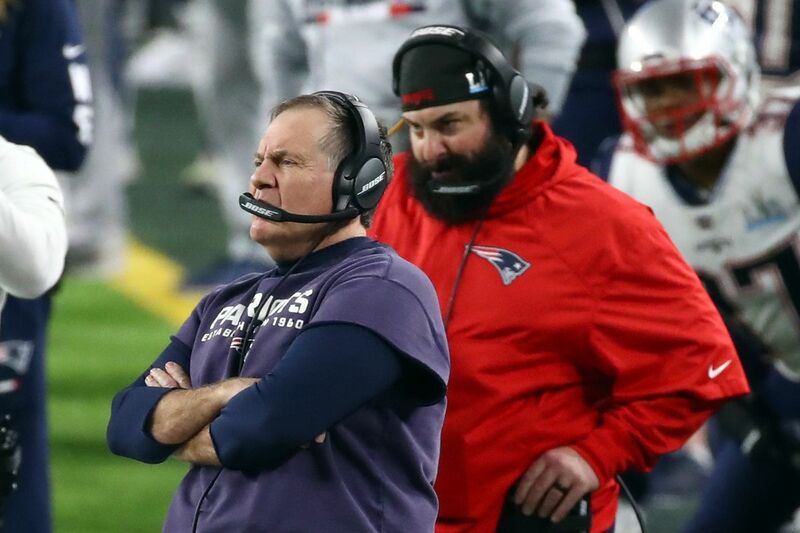 After beating the Atlanta Falcons in the Super Bowl, Belichick once again attacked the offseason as if he wanted to exterminate the NFL in a league wide game of Risk. He traded his first round pick for Brandin Cooks, he moved out of the second round into the third for Kony Ealy, he moved out of the 4th round for the 6th round to get Dwayne Allen, and he paid Stephone Gilmore a whole much of money to switch AFC East jerseys. It seems Belichick was motivated to capitalize on the remainder of the Tom Brady window. It didn’t result in a Super Bowl victory but the Patriots went 13-3, were the 1 seed in the AFC and made it to their 8th Super Bowl under Belichick and Brady. Obviously they lost the game on defense. In a game where Brady threw for 505 yards, and the team never punted, the defense found away to be worse than the offense was good. They allowed 538 yards of offense, Philly won the time of possession battle 34:04 to 25:56, and the Eagles converted 66.66% of their third and fourth downs combined. The defense needed to make one stop for the Patriots to win that game. Just one. They didn’t. They also didn’t sack Nick Foles. Not a single time. He seemingly never had any pressure all day. So, yes, I think Belichick will go nuclear this offseason. Or at least what the Manhattan Project is in comparison to a modern day nuclear arsenal. Tom Brady is still winning his hide and seek game against father time, but no one knows for how long he can continue doing so despite how much pliability he may achieve. Gronk is apparently contemplating retirement. Garoppolo is a 49er. The time to be aggressive is now. The Patriots are looking at about $17.5 million of cap space this offseason, but have an easy avenue toward a significantly larger amount. By cutting both Martellus Bennet and Dwayne Allen, the Patriots can save another $11.1 million, as neither has any dead money on the cap. I expect the team to decline Alan Branch’s team option, considering he was a healthy scratch for the Super Bowl, along with waiving Mike Gillislee, another healthy scratch. They will probably say goodbye to one of Phillip Dorsett or Kenny Britt, or perhaps both, with Malcolm Mitchell presumably returning in 2018. I would imagine only Britt will be released, as the Patriots have an asset invested in Dorsett via the Brissett trade. They can also cut David Harris. These moves open up a total of almost $38 million of space for the Patriots. They do have major free agent decisions to make. Amendola isn’t under contract but has continuously taken less money to stick with the team. I expect the two sides to find a deal. Malcolm Butler is as good as gone. The most difficult decisions the Patriots will have to make are at offensive tackle and regarding Dion Lewis. Starting left tackle Nate Solder, backup tackle Cameron Fleming, and backup tackle LaAdrian Waddle are all unrestricted free agents. As a veteran starting left tackle in the NFL, Solder could command up to $13 million annually, and paying market value isn’t something Belichick normally does. However, protecting Tom Brady as he attempts to play into his mid-40s is paramount. The team is high on starting right tackle Marcus Cannon, but he spent most of the season on IR. Having a backup swing tackle the quality of Cameron Fleming is important as Solder has fought injuries himself during his career. Dion Lewis took over as the starting running back midseason and quietly dominated the NFL. He finished 2017 as the #1 RB by DVOA. He accumulated 1,100 total yards, 9 total touchdowns, while averaging 5.19 yards per touch on 212 touches. Lewis could command around $5 million annually in free agency, a number Belichick doesn’t pay running backs. Muddying the running back depth chart is that Rex Burkhead is also a free agent. He has proven to be an extremely versatile offensive weapon, the type of guy Belichick loves to have around. If Lewis leaves for more money the Patriots may prioritize keeping Burkhead around. I’m not sure the odds are too high of both returning. Special teams ace Matthew Slater is also a free agent. But it’s the defense we should be speaking about anyway, right? Yes, the above roster issues are significant issues, but the Patriots didn’t lose the Super Bowl on offense. Defensive contributors James Harrison and Marquis Flowers are both free agents, but I don’t know what type of contract Belichick will really be willing to offer either. Harrison may take next to no money to stick on a contender. But they need help everywhere. Once Hightower was lost to injury the Patriots became contenders for the worst group of linebackers in the NFL. The Patriots were abysmal against the run throughout the season. They finished 21st in defensive 3rd down conversation rate. Going after a major splash such as Demarcus Lawrence or Ziggy Ansah is probably out of the Patriots price range. A typical Belichick way is to get a veteran like Julius Peppers (or James Harrison) to come chase a ring for a small amount of money. Peppers is probably unlikely to leave the Panthers but you never know I suppose. A bigger name the Patriots may just be able to bring in is Dontari Poe. After having no luck finding a long-term deal last offseason, Poe settled for a one year contract with the Falcons to get back onto the market in 2018. I’m not entirely sure what Poe is looking for on the market, and I don’t know if Belichick wants to make a long term commitment to a guy with a previous back injury, but if Poe’s market is cooler than expected and he is looking for another one year deal, he could choose to do it chasing a ring in New England. There are a few of logical links to Poe for the Patriots. Former Patriots Vice President of Player Personnel, and Belichick friend, Scott Pioli was the General Manager of the Chiefs when they drafted Poe in 2012. The draft selection drew an easy characterization that Pioli made the move to give the Chiefs a Vince Wilfork for their defense. Poe would also give the Patriots a massive nose tackle for their line, allowing Belichick flexibility in his defensive packages. I anticipate they will bring in some veteran linebacker to fill their void at the position. Out of necessity the Patriots were using Hightower on the edge before he got hurt, but I have to imagine they would prefer to use him on the inside. The Patriots may chase a younger linebacker, such as Kevin Minter, in free agency, although this would keep Hightower outside. Free agents that profile as players Belichick will go for in free agency, should they hit the market, are Paul Posluszny, Connor Barwin, Koa Misi, and Ahmad Brooks. They also desperately need secondary depth. They go three deep at safety, but Devin McCourty regressed from elite safety to barely above-average starter in 2017. I don’t want to over react as McCourty has earned the benefit of the doubt, but McCourty is 31 in August and could be naturally declining at this stage of his career. With Butler already one foot out the door the Patriots will need corners behind Gilmore. Rowe will be on the roster next season but they could find a better option to start opposite Gilmore. However, after handing so much money to Mr. Gilmore last offseason, Belichick probably won’t make a splashy move in the secondary either. Prince Amukamara seems like the typical veteran addition Belichick would make, but he has his own injury history. If John Elway outright cuts Aqib Talib perhaps a one year reunion could be in the works if Talib wanted to chase another ring. It’s entirely possible he would rather score the final lucrative contract of his career. For the second straight season the Patriots are light on draft capital. They only have five selections before compensatory picks have been awarded. So, we can probably assume Belichick will trade down somewhere along the lines. Given that I think Belichick will be aggressive in this offseason I find it more likely he trades down from the 49ers second round pick than the Patriots first round pick. The draft is shaping up to be talented on the defensive side of the ball, and the Patriots will have multiple options available to them along the defensive line and linebacker at 31st overall. One thing we can count on the Patriots to do in the draft is select a quarterback at some point. In 18 drafts under Bill Belichick the Patriots have selected 9 quarterbacks, never more than one in a single draft. They basically take one every other season. They did not select one in 2017 and have no young quarterback to groom behind Brady. Belichick will not spend the offseason simply adding rookies and a couple veterans to fill out the roster. The Patriots will have a decent amount of money to bring in some contributors to maximize the remaining years of Tom Brady. The optimistic outlook is that the defense can only get better, even if they are due to lose Butler to free agency. Hightower will be back and I would anticipate Belichick goes more John Elway circa Peyton Manning twilight years than standard Bill Belichick. Hi there! The Eagles were clearly the better team in this SB. I would also say that had the Seahawks and Falcons played smarter football in their respective SB’s, they would have won as well. The 70’s Steelers, who won 4 Times in 6 years, were far more dominant than these Pats (who were lucky to survive against the Jags). Regards, Steve Krevisky, Stewart’s math colleague.